Share evidence of your endeavors using the hashtag #festive500. Prizes will be awarded to riders in the following categories: Most Inclement, Best Story, Prix de la Combativité, Best Photography, with a special Grand Prize for Creativity. In past editions, stories have been shared in the form of photojournals, hand-bound illustrated pamphlets, videos, postcards, letters, blogs, and the old favorite, email. Learn more by visiting the the Rapha Festive 500 webpage. Cutoff date to submit evidence and/or claim the finishers roundel from Rapha is January 14th, 2015. 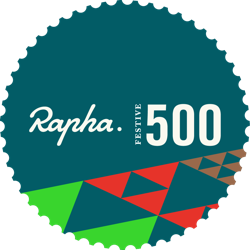 Riders that complete the Challenge will receive a Rapha Festive 500 woven badge (roundel) to commemorate their achievement. Finishers must submit their mailing info to Rapha by January 14th, 2015 to receive their roundel. Visit the Rapha Festive 500 webpage on Rapha's site to enter your info after the Challenge ends. You may enter the Skill Challenge by going to the Site on or before Devember 31, 2014, clicking on the corresponding Skill Challenge URL that will direct You to the Skill Challenge landing page, where You will be entered into the Skill Challenge by clicking on the Join button. Starting from the day the Skill Challenge begins on December 24, 2014, you have until Devember 31, 2014 to ride 500 kilometers. Each activity (Ride) must be logged on the Site and cannot be inputted manually. For more information regarding how to log activities on the Site, please see Strava’s How It Works page (http://www.strava.com/how-it-works). If You successfully ride 500 kilometers between December 24, 2014 and Devember 31, 2014, You will be a prize winner, subject to Sponsor’s verification. Any form of entry and participation in the Skill Challenge other than that described herein is void. Each prize winner will win a commemorative woven badge (Approximate Retail Value ("ARV"): $0. Total ARV of all prizes: $0. Sponsor will announce the potential winners of the Skill Challenge within one (1) week after the conclusion of the Skill Challenge on Devember 31, 2014. All potential winners will be notified via the email address associated with the potential winner’s account and will be posted on Sponsor’s Site (http://www.strava.com/challenges/rapha-festive-500-2014). Prizes will be deemed to have been won when all conditions in these Official Rules and accompanying Terms (http://app.strava.com/terms) are met. You have not yet won a prize. The actual odds of winning any prize will depend upon an entrant’s ability to complete the Skill Challenge. Skill Challenge ends on Devember 31, 2014. See Official Rules above for entry requirements and complete prize restrictions. Sponsored by Strava,500 3rd St, Suite 110, San Francisco, CA 94107.